Located on the ninth floor of a nondescript commercial building in Nishi-Azabu, and identifiable only because of a row of United Nations-like flags outside, the diminutive yet cheery offices of the Embassy of the Republic of Nicaragua are perhaps parallel to that country’s influence on the world stage. 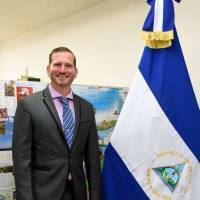 To newly appointed Ambassador Rodrigo Coronel, however, while regular people in Japan do not know much about his country, “Because we (Nicaragua) have not really showcased what we have to offer,” he is not faced with a challenge, but instead an amazing opportunity. “I am an ambassador that loves meeting people from all walks of life, and I want to experience Japan and its culture through interactions with them. This way, I experience Japan and they get to know about Nicaragua,” he said during a recent interview with The Japan Times. Describing himself as happy-go-lucky and as someone who “works every day like it will be my last,” the ambassador said, “One of my personal missions is to convince every Japanese person I meet how wonderful Nicaragua is.” Traveling by local train, using side streets as opposed to main thoroughfares and starting up conversations in restaurants are just some of the more unorthodox approaches the former public relations and marketing specialist is using to promote knowledge of his country. “The usual Japanese visitor to Nicaragua is perhaps a retiree, or someone coming on the Peace Boat (the Japan-based, international nongovernmental organization that has run global voyages for peace and international exchange since 1983),” said Coronel, noting that the 28-hour journey between the two countries is certainly a deterrent for time-pressed Japanese. Acknowledging that Nicaragua cannot — “and nor should we” — compete against some of the more established tourism markets for Japanese visitors, Coronel believes focusing on niches and using long tail marketing strategies is, for him, the best approach. “A lot of people don’t know of Nicaragua’s very good surf beaches and that it’s hosted international championships,” said the ambassador, referring to the country’s 250-kilometer Pacific Ocean coastline’s consistent waves and offshore winds in hotspots such as Popoyo. “I know Japan has a big surfing subculture; it’s a niche I’d like to exploit,” Coronel said. He recently had a chance to test out his niche-market theory during a recent trip to Enoshima Island. “I took a brochure — of Nicaragua — we had,” he said. “I went to where the surfers were and showed them the brochure and they were amazed and wanted to know where the beaches were. I explained to them about Nicaragua and now they want to go. I gave the bar owner, a big dude from Okinawa, a surfing t-shirt from Nicaragua. He has become an ambassador of surfing in Nicaragua. It’s the little things like that which will help drive visitors to my country. It’s not me from Nicaragua telling you to go, it’s another guy telling you to go to Nicaragua and surf, and he’s the surfing expert, not me,” said Coronel. While Coronel admitted his approach isn’t for everyone, his desire to connect with regular people is not for selfish reasons, and has not detracted from so-called normal ambassadorial duties and work. Instead, he sees it as another facet of his role. “This is a fantastic chance for me to try to express to every Japanese person that they should feel proud of their (governmental) contributions that help the Japan International Cooperation Agency and nonprofit organizations that in turn truly help my country. We Nicaraguans are very grateful; this aid goes to social projects that our government uses for building better infrastructure and hospitals — the money goes to the people who need it the most. Beyond that, there is also information. Like Japan, we have earthquakes and volcanoes and tsunami in Nicaragua. So, all this information and aid coming from Japan also helps us in preventing the impacts of these disasters,” Coronel said. “I am very lucky to be in my position,” continued Coronel, stressing he did not take his position for granted. “I am very grateful to my staff here at the embassy; we often all eat together. I’m also very thankful to those who are doing their job (such as the police and translators) in helping me do my job.” Sending thank you notes and learning how to make origami cranes are just little gestures that Coronel hopes will convey his appreciation and help him remain grounded. Being grounded is important to Coronel, for it was when he was younger that he first became interested in Japan, through anime, and never did he believe that he would one day end up being an ambassador in the country that formed much of his childhood dreams. “I am an otaku (geek),” Coronel said with a laugh, admitting that he had been a fan of anime for years. “I remember when I first watched ‘Astro Boy’ (Mighty Atom) on TV,” he said. “Death Note,” “Gintama” and “Dragon Ball Z” are others he also mentioned. Seeing anime locations and backdrops in reality has also been thrilling. “My mom has joked that this job really is a dream come true,” said Coronel. But for the young ambassador, it is perhaps Japan’s many paradoxes that are, as a newcomer, currently grabbing his attention. “The beauty about Japan is that there is a wonderful color palette (that exists) in perfect harmony. Ancient and modern, city and nature, seriousness and happiness. It’s like a perfect piece of sushi. A perfect piece of sushi has both wonderful rice and wonderful fish. Each, by itself, is very different. But they complement each other. (Things in Japan are) imbalanced or different, but they work for the betterment of the whole,” he said. According to Nicaraguan Ambassador Rodrigo Coronel’s LinkedIn profile, it is not your job that defines you, but instead what you do within that role for the betterment of others. Bringing an enthusiastic perspective to his role, Coronel completed his undergraduate studies in marketing at Duquesne University and the University of Mobile before embarking on a Master of Science in marketing at John Hopkins University in the United States. He briefly worked at the National Association of Criminal Defense Lawyers in Washington D.C. before joining Procter & Gamble Co. in 2005, working on accounts such as Old Spice and other grooming brands. Passionate about public relations, marketing and corporate social responsibility, Coronel was recruited by the chief marketing officer of Yum! Brands (USA) in 2014 to support the turnaround of KFC Corp., overhauling external brand communications and real-time marketing functions. 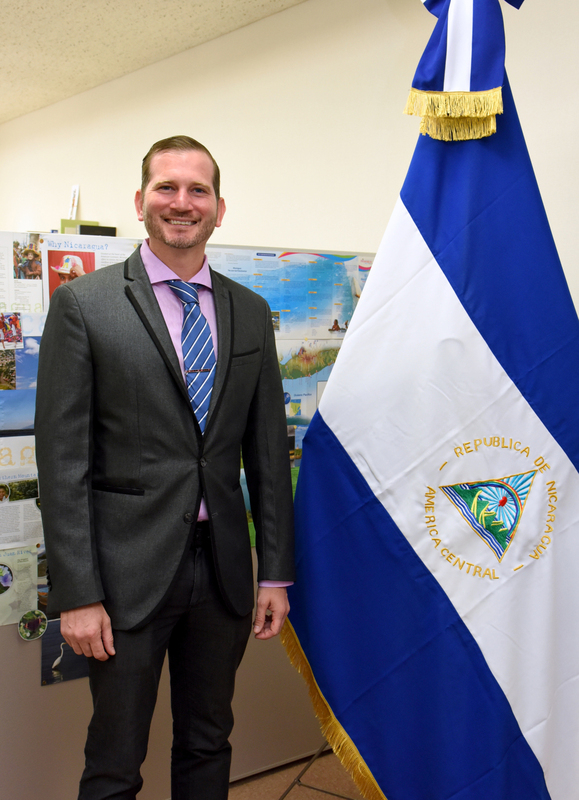 Returning to Nicaragua in late 2016, he assumed his current position in mid-2018. Coronel has a long-standing interest in anime and enjoys hiking, eating street food and meeting people.